This is a serious ice cream store – a landmark of my youth. They are not daunted by the season; they sell ice cream through the most frigid of months. 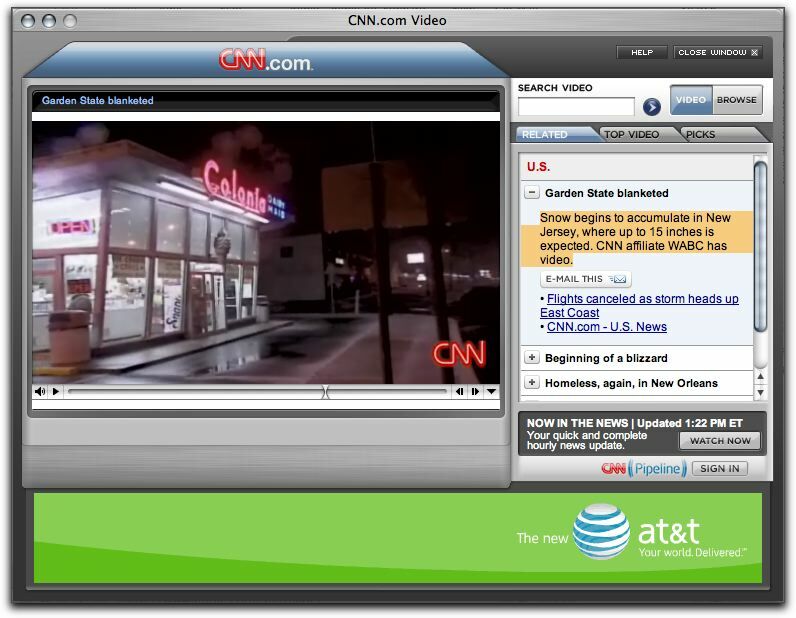 This shot is from storm footage on CNN. Somehow when I saw the images in the deep of winter it wasn’t the right time to post it. But now, with July racking up another week of 90+ degree days it seemed right. A welcome dreamy relief of flakes drifting down eatting ice cream. That will be the thought I hold onto for the remainder of these dog days. I remember many a car trip to the place I ordered a sugar cone or maybe a cup with one scoop of buttered almond and another of coffee ice cream. My dad got me hooked on coffeee ice cream. We would both order it and sit in the car and savor each spoonful as a few other brave souls hoped out of their cars wrapped in scarves and mittens. Omni Group is set to release a public beta of its not so secret new app OmniPlan. That’s the sweet little icon for the app. This is pretty exciting considering any of the project planners out in the world are not well designed experiences. Creating timelines and reports are tedius. No matter how much time you you spend they look like crap and end up putting them in a vector application or maybe Omnigraffle. Omni Group apps are topdrawer in our toolkit at Stellarvisions. We have created templates to brand all of our maps and schematics. When you see our stuff you know it is our stuff. That’s because Omni Group knows how important presentation is along side function. We look forward to testing the beta and seeing how this will integrate with our other favorite tools. Did I mention OmniOutliner? 20 hours and 44 minutes to go! This is one of the most inspiring fountains I’ve had the pleaseure to visit. It is outside the Pompideu. The organic shapes and colorful spinning objects can keep you in a trance for hours. I took this photo years ago and rediscovered it while doing some scanning of images last week. 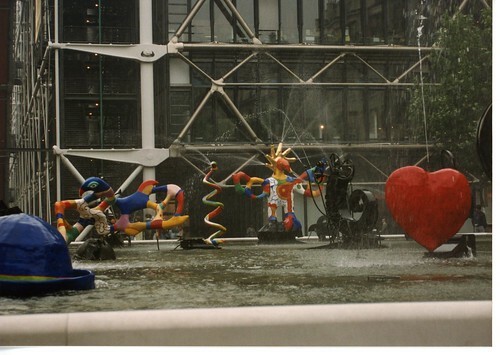 I think about this fountain often recalling the trails of water so fluid against the geometric steel of the Beaubourg. I had been looking forward to experience the cool spraying waters the last time I visited. But, the fountain was under renovation and Paris was too hot. I look forward to my next visit. I’m working on a new drawing inspired by the memory. also check out the webcams. Best of all take a trip to Paris. This was one of the most amazing demonstrations of glassblowing that I have every seen. The Maestro demonstrated the techniques of Venetian glass blowing. The goblet he is working on here included gold leaf and laticework color. I had never seen glass objects inserted inside each other and then joined. The experience showed the hands and intellect of experience and age. You can see more of my photos at my flickr set. 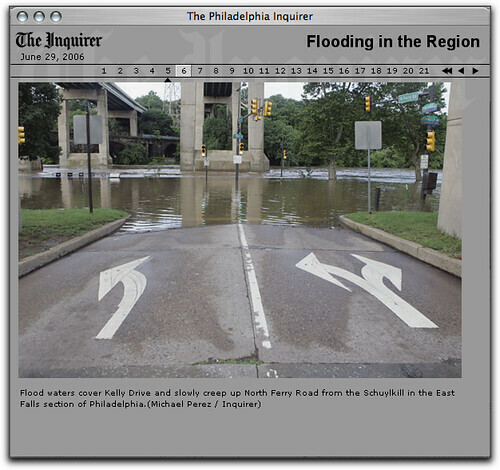 This is the view after the recent floods along the East River Drive. This happens often when you live in the flood plain. So which lane would you take? If you live near by you know to head up hill to go anywhere when the rains have been constant. You also get the idea why this is called Ferry Road.